DRACULA SLOT by Netent & Universal - Bat Mode for Huge Wins ! NetEnt has come up with a number of thrilling monster-themed slots, however Dracula ™ has to be the best one yet! After launching Frankenstein™ , The Invisible Man™ and many more horror movie based games, the slot provider teamed up with Universalⓒ once again to develop another hair-raising slot. The game begins with a short film which really sets the tone for the entire gameplay. Watch as a young girl is chased by a colony of bats through the dark narrow streets of a village, the full moon gleaming in the night sky. As she takes a left turn in an attempt to throw the creatures off trail, she trips and falls flat on the ground. Something creeps up behind her, and you can read the fear in her eyes as she comes face to face with count Dracula, who’s only motive is to quench his thirst for blood. Inspired by the 1931 Dracula movie, the incredibly realistic 3D graphics take the gaming experience to a whole new level. Dracula sits by the reels, looking rather ominous and eerily staring into the player’s eyes, drumming his fingers on the armrest of a stone throne – he seems to be judging your every move. As you press the spin button, it explodes into a flight of bats, flapping away into the midst surrounding the reels. In the background the sound of agonizing, terrifying music really immerses the player into this world of Vampires straight out of the original novel which first introduced count Dracula back in the 19th century. Dracula online video slot is ideal for all those hooked on the Twilight series or simply fond of horror movies, yet its stunning graphics and animations paired with its interesting features are sure to leave nobody indifferent. Plunge into a bone-chilling world inhabited by Vampire to give hitting the jackpot -which adds up to £80,000- a try during the exciting Free Spins feature it offers! Dracula slot sports 5 reels, 4 rows and 40 fixed bet lines. Even though the lines may not be changed, the bet level, which ranges from 1 to 10, and the wager may easily be adjusted. The coin value may be altered from the ‘coin value’ box, and ranges from 1p to £1. Hence, this gives a minimum bet starting at 20p, and a maximum bet of £200. This video slot features some classic symbols of the online gaming world, which have however been designed to fit the universe this game delves you into. The traditional A, K, Q and J symbols, representing the lowest paying symbols, are depicted on coats-of-arms embellished with golden bats. The highest value symbols are represented by count Dracula himself, alongside a charming young lady, his object of desire. These symbols may appear stacked or partially on reels 2 and 4. These two symbols have a lot in store for players – not only are they the highest potential winning symbols, both paying 200 coins if one is to land 5 of them on a winning pay line, but they also trigger exciting special features! During the Free spins, another stacked symbol may appear. This Wild stacked symbol depicts Dracula holding the lady by the waist, staring lovingly into her eyes. Regarding the lower value symbols, they represent cartoon-like figures, each of them holding specific objects; a large woman clutching a small dog, a man holding out a wine bottle and lastly a young beggar. They all share the same value in the pay table, a combination featuring 5 of those symbols on an active bet line paying 60 coins. This online slot game also features a Wild symbol, represented by a blood red W. It may act a substitute for any other symbol, appearing on reels 2, 3 and 4. The animations in this game prove once again the know-how of the Swedish provider – when a player lands a winning combo, the symbols it features will animate. Watch as the facial expression of Dracula’s victims suddenly changes, leaving them looking absolutely terrified. This video slot game may have a classic slot engine, however it boasts many interesting special features, including Free Spins! During the latter, the RTP (Return to Player) is of 31.28%. The hit frequency for the Dracula ™ Free Spins is 0.62%, meaning they fall on average every 161th spin. In order to trigger the Free Spin feature, one must land the two full stacked symbols, which will provide 10 Free Spins. If luck is on your side and the stacked Wild makes an appearance on the reels during the Free Spins, you will receive 2 extra Free Spins. The most exciting feature of Dracula online slot however is undoubtedly the Bat Feature. During this innovative special feature, Dracula hisses, transforming into a swarm of bats which fly across the reels. When the reels stop, they land to form a cluster, turning into a random symbol. 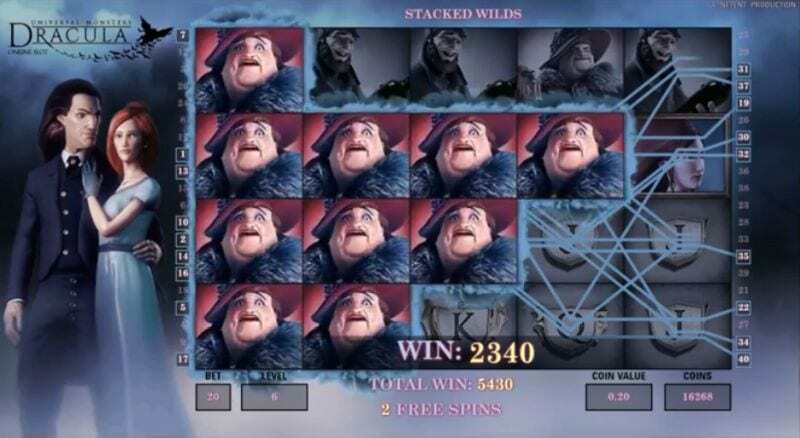 Although it may occasionally appear during the main game, it offers the best opportunities at hitting a big win during the Free Spins, since it is activated on every spin. Plunge into the mysterious, spooky world of Dracula ™ for a uniquely thrilling experience! 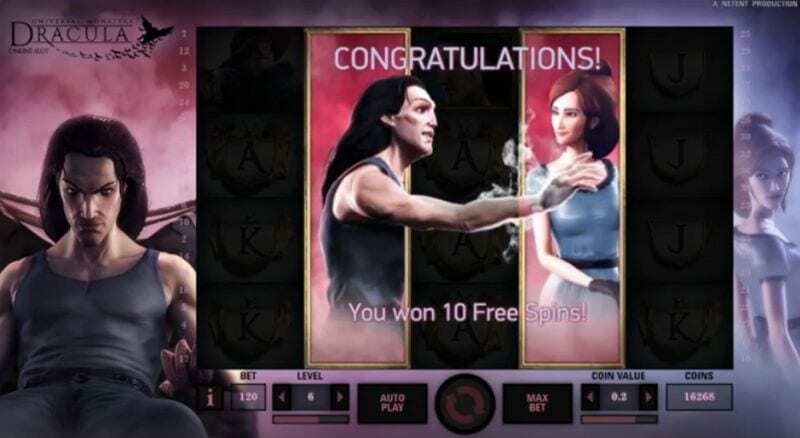 The high definition graphics and spine-chilling realism of the animations featured in this slot machine, paired with the creepy soundtrack chosen by NetEnt create a supernatural atmosphere. This medium low volatility slot is perfect for gamblers who enjoy classic horror movies which make their heart skip a beat. It is compatible with practically all types of media, such as smartphones, tablets and pc. On top of innovative special features, this mobile slot offers a total RTP of 96.58%, of which 65.30% may be obtained thanks to the main galme and 40 fixed pay lines the slot presents us with. 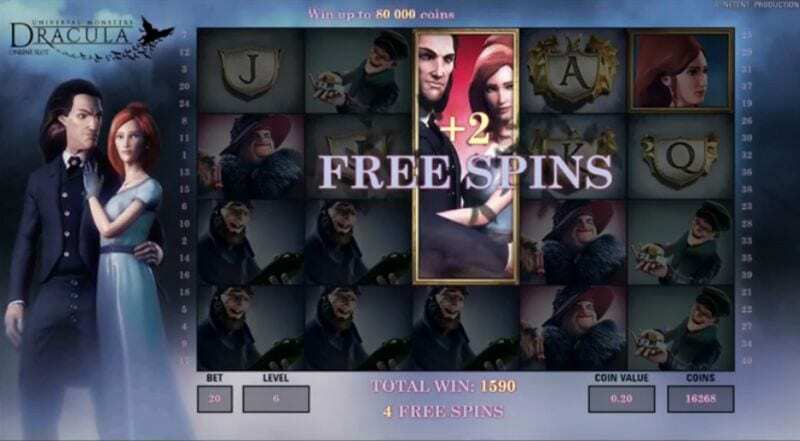 The remaining 31.28% may be collected during the Free Spins. On this medium/low slot machine, the min bet is of 20p, and the maximum bet – hence, the one with which you have the most chances of hitting a big win – is of £200. A maximum win of £80,000 during the Free Spins is at stake! The amazing gaming experienced offered by this slot due to its meticulous design is sure to delight many players who do not compromise on quality and appreciate sophisticated special features which offer a chance at hitting some mega wins.